Unchanged for 2012, the rear-wheel-drive Hyundai Genesis Coupe 2.0T delivers a capable mix of power, handling and attractive styling. Power comes from a 2.0-liter 4-cylinder engine, which features a twin-scroll turbocharger, a large intercooler and continuously variable valve timing (CVVT). Hyundai pairs the engine with either a 6-speed manual transmission, which comes standard, or an optional 5-speed automatic with a Shiftronic manual-shift feature and steering-wheel-mounted paddle shifters. Fuel economy numbers check in at 21 mpg city/30 highway with the manual shifter and 20/30 with the automatic. Safety features include 6 airbags as well as electronic stability control and antilock brakes with brake assist and electronic brakeforce distribution. Outside, the Genesis Coupe 2.0T displays a sporty, muscular appearance, highlighted by a wide-mouthed grille, blacked-out lower front fascia, sculpted hood with air intakes, swoopy sidelines and a tapering roofline. Projector-beam automatic halogen headlights, power side mirrors and 18-inch Euroflange alloy wheels with Bridgestone Potenza tires are among the other exterior features. Inside, the 4-passenger Genesis Coupe comes well-equipped with such standard features as a leather-wrapped shift knob, air conditioning with an outside temperature display and a 6-speaker, 170-watt AM/FM audio system with a CD/MP3 player, SiriusXM satellite radio, iPod port and auxiliary input jack. Dark metalgrain and chrome interior accents add an upscale feel, and the leather-wrapped steering wheel includes audio, cruise and Bluetooth controls. Cloth upholstery, remote keyless entry and power windows and door locks are among the other standard interior features. The performance-oriented Hyundai Genesis Coupe 2.0T R-Spec, which rolls into 2012 unchanged, comes equipped with a number of features not found on the entry-level 2.0T trim, including an upgraded suspension with larger stabilizer bars, a front strut brace and a Torsen limited-slip differential, as well as larger 19-inch gunmetal-finish alloy wheels with high-performance Bridgestone Potenza tires. Interior upgrades for the 2.0T R-Spec include unique front seats with black leather bolsters and red cloth inserts, as well as red leather accents on the armrest. However, Hyundai also removes a few features found on the base 2.0T trim, such as automatic headlights, cruise control and some metalgrain interior accents, to help reduce weight and cost for the R-Spec. Upscale features in the 4-passenger cabin include a leather-wrapped black steering wheel and shift knob, steering-wheel-mounted audio and Bluetooth controls, air conditioning with an outside temperature display and a 6-speaker, 170-watt AM/FM audio system with a CD/MP3 player, SiriusXM satellite radio, iPod port and auxiliary input jack. Remote keyless entry and power windows and door locks are among the other standard interior features. Power for the 2.0T R-Spec comes from a turbocharged 2.0-liter 4-cylinder engine, which features continuously variable valve timing (CVVT) and an intercooler. The engine links to a 6-speed manual transmission, which is the only transmission available for this trim. Fuel economy numbers check in at 21 mpg city/30 highway. Standard safety features include 6 airbags as well as electronic stability control and antilock brakes with brake assist and electronic brakeforce distribution. Outside, the Genesis Coupe 2.0T R-Spec displays an athletic, aggressive appearance, thanks to a wide-mouthed grille, blacked-out lower front fascia, sculpted hood with air intakes, swoopy sidelines and a tapering roofline. Projector-beam halogen headlights and power side mirrors are among the other standard exterior features. The 2012 Hyundai Genesis Coupe 2.0T Premium, which receives no updates for 2012, comes equipped with a number of upscale features not found on lower-end 2.0T trims, including a touchscreen navigation system, a power driver's seat, push-button start, a power tilt/slide sunroof and an auto-dimming rear-view mirror. In addition, Hyundai equips the 2.0T Premium with an upgraded 10-speaker, 360-watt Infinity audio system with a subwoofer, SiriusXM satellite radio, a CD/MP3 player, an iPod port and an auxiliary jack. The standard feature list also includes dark metalgrain and chrome interior accents, a leather-wrapped shift knob, automatic air conditioning with an outside temperature display and a black leather-wrapped steering wheel with audio, cruise and Bluetooth controls. Remote keyless entry and power windows and door locks are among the other standard interior features. Outside, the 2.0T Premium displays a sporty, muscular appearance, thanks to such features as a wide-mouthed grille, a blacked-out lower front fascia, a sculpted hood with air intakes, swoopy sidelines and a tapering roofline. Projector-beam automatic halogen headlights, power side mirrors and 18-inch Euroflange alloy wheels with Bridgestone Potenza tires are among the other exterior features. Under the hood, Hyundai drops a turbocharged 2.0-liter 4-cylinder engine, which features an intercooler and continuously variable valve timing (CVVT). The engine mates to a 5-speed automatic transmission with a Shiftronic manual-shift feature and steering-wheel-mounted paddle shifters. Fuel economy numbers check in at 20 mpg city/30 highway. Safety features include 6 airbags as well as electronic stability control and antilock brakes with brake assist and electronic brakeforce distribution. Delivering sporty performance and a stylish exterior design, the Hyundai Genesis Coupe 3.8 R-Spec, which remains unchanged for 2012, comes equipped with a number of performance-oriented features not found on other Genesis Coupe trims, including an upgraded suspension with larger front and rear stabilizer bars, a front strut brace and a Torsen limited-slip differential. Hyundai also includes larger 19-inch gunmetal-finish alloy wheels with high-performance Bridgestone Potenza tires. Interior upgrades for the 3.8 R-Spec include unique front seats with black leather bolsters and red cloth inserts, as well as red leather accents on the armrest. However, Hyundai eliminates a few features found on other Coupe trims, including automatic headlights, cruise control and some interior metalgrain accents, to help reduce weight and costs for the R-Spec. Power comes from a 3.8-liter V6 engine, which generates 306 hp and 266 lb-ft of torque. The V6 mates to a 6-speed manual transmission, which is the only transmission available on this trim. Fuel economy numbers check in at 17 mpg city/26 highway. Safety features include 6 airbags, as well as electronic stability control and antilock brakes with brake assist and electronic brakeforce distribution. Outside, the 3.8 R-Spec exhibits a muscular, sporty design with a wide-mouthed grille, a blacked-out lower front fascia, a sculpted hood with air intakes, swoopy sidelines and a tapering roofline. Projector-beam halogen headlights, front foglights and power side mirrors are among the other exterior features. Inside, standard features include a leather-wrapped black steering wheel with audio and Bluetooth controls, a leather-wrapped shift knob and automatic air conditioning with an outside temperature display. Driver's lumbar support, remote keyless entry and power windows and door locks are among the other standard interior features. The upscale Hyundai Genesis Coupe 3.8 Grand Touring, unchanged for 2012, delivers a high level of comfort and style, thanks to such standard upscale features as brown leather upholstery, a touchscreen navigation system, a power driver's seat, push-button start, a power tilt/slide sunroof and an auto-dimming rear-view mirror. In addition, Hyundai equips the 4-passenger 3.8 Grand Touring with a 10-speaker, 360-watt Infinity audio system with a subwoofer, a CD/MP3 player, SiriusXM satellite radio, an iPod port and an auxiliary input jack. Also included are such standard features as dark metalgrain and chrome interior accents, automatic air conditioning with an outside temperature display, a leather-wrapped shift knob and a leather-wrapped black steering wheel with audio, cruise and Bluetooth controls. Remote keyless entry and power windows and door locks are among the other standard interior features. Outside, the 3.8 Grand Touring displays an aggressive, sporty appearance, highlighted by a wide-mouthed grille, a blacked-out lower front fascia, a sculpted hood with air intakes, swoopy sidelines and a tapering roofline. Projector-beam automatic halogen headlights, heated power side mirrors and 18-inch Euroflange alloy wheels with Bridgestone Potenza tires are among the other standard exterior features. For power, the rear-wheel-drive 3.8 Grand Touring continues to receive a 3.8-liter V6 engine, which generates 306 hp and 266 lb-ft of torque. The V6 mates to a 6-speed ZF automatic transmission with a Shiftronic manual-shift mode and paddle shifters, and posts fuel economy numbers of 17 mpg city/27 highway. Safety features include 6 airbags as well as electronic stability control and antilock brakes with brake assist and electronic brakeforce distribution. 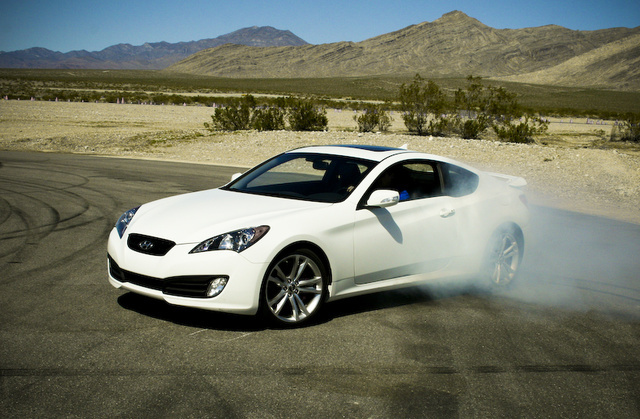 The performance-oriented Hyundai Genesis Coupe 3.8 Track, which rolls into 2012 unchanged, comes equipped with a few features not found on other Genesis Coupe trims, including HID automatic headlights and aluminum foot pedals. Inside, the 3.8 Track also receives such upscale features as black leather upholstery, a touchscreen navigation system, a power driver's seat, push-button start, a power tilt/slide sunroof and an auto-dimming rear-view mirror. For entertainment, Hyundai equips the 4-passenger 3.8 Track with a 10-speaker, 360-watt Infinity audio system with a subwoofer, SiriusXM satellite radio, CD/MP3 player, iPod port and an auxiliary input jack. Metal-grain and chrome interior accents enhance the upscale appearance, along with a black leather-wrapped steering wheel with audio, cruise and Bluetooth controls. Automatic air conditioning with an outside temperature display, a leather-wrapped shift knob, remote keyless entry and power windows and door locks are among the other standard interior features. A 3.8-liter V6 engine powers the rear-wheel-drive 3.8 Track. The V6 produces 306 hp and 266 lb-ft of torque, and mates to either a 6-speed manual transmission, which comes standard, or an optional 6-speed ZF automatic transmission with a Shiftronic manual-shift mode and paddle shifters. Fuel economy numbers check in at 17 mpg city/26 highway with the manual shifter and 17/27 with the automatic. Standard safety features include 6 airbags, as well as electronic stability control and antilock brakes with brake assist and electronic brakeforce distribution. In addition to HID headlights, exterior features include heated power side mirrors and 19-inch gunmetal-finish alloy wheels, along with a wide-mouthed grille, a blacked-out lower front fascia, a sculpted hood with air intakes, swoopy sidelines and a tapering roofline.